The Rock Shags - also known as Magellanic cormorant (Phalacrocorax magellanicus) - are marine cormorants that occur naturally around the southernmost coasts of South America. They breeding range stretches from around Valdivia, Chile, south to Cape Horn and Tierra del Fuego, and north to Punta Tombo in Argentina, Breeding populations have also established themselves around the coasts of the Falkland Islands. For the winter, these migratory birds move as far north as Santiago, Chile on the west coast and Uruguay on the east. 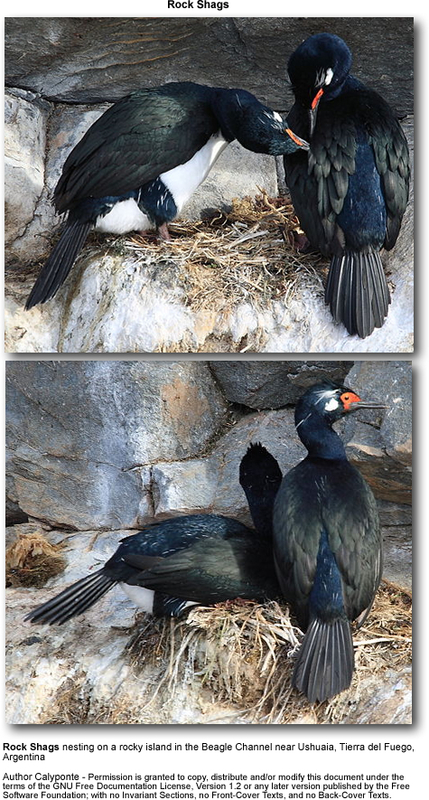 The Rock Shag has a black and white plumage, with the head, neck and upperparts being black and the plumage below being white. The black areas have a glossy blue to oil green sheen to them, and are flecked with white in some places. The legs and feet are pinkish flesh-colored. The bare skin around the beak and eyes are brick red. When they are in breeding condition, they have a blackish crest on the forehead and distinctive white ear patches. Males and females look alike; except the male being slightly larger. Rock Shags feed by diving for their prey. They typically feed close to the shore, often diving at the edge of kelp beds, where they find small fish (predominantly cod icefish, Patagonothen sp.) sheltered amongst the weed. The Rock Shags typically nests on ledges of steep, bare, rocky cliffs. The average clutch consists of 3 eggs, however, 2 up to 5 may be laid. They typically nest in colonies from 5 pairs up to nearly 400.